Welcome to SPOILERSVILLE, U.S.A. I’m reviewing Guardians of the Galaxy, and I’m not holding anything back. If you’ve not seen the movie yet. Stop, right now and go watch it. There’s something spoiler-free you can take away: I haven’t even started the review yet and I’m telling you to go see it. I’ll wait…. Okay, you back? Good. Now I don’t say this lightly: Guardians of the Galaxy may be Marvel’s best yet, it may very well be the best comic book movie to date. Everything from the incredible set pieces, down to the tiniest details hinting at the much larger universe was done exceptionally well. Director James Gunn focused on Marvel’s strengths and brought so much more to the playing field – I have no doubt the cinematic and storytelling ramifications will ripple into the rest of their ensemble. 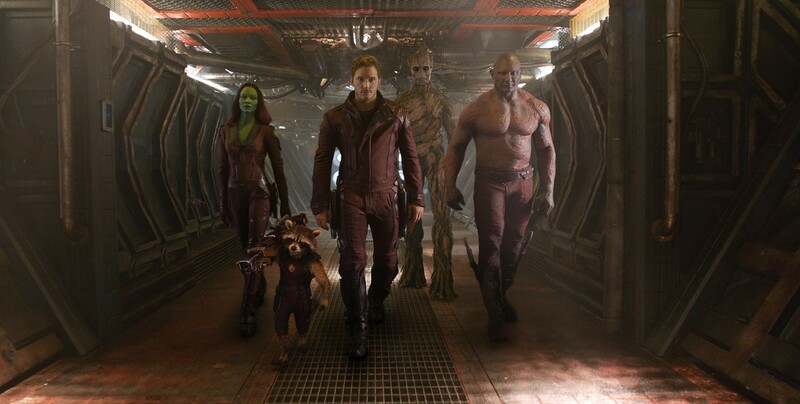 Guardians‘ captures everything a summer blockbuster needs to be. Lately, summer blockbusters have forgotten one of the biggest reasons people go to the movies: fun. This is easily one of the most fun movies I’ve seen in a very long time. What’s more it’s also one of the funniest movies I’ve seen in a while. The film’s plot was tight and fast, but I mean fast. Few films have so thoroughly embodied the “roller coaster” metaphor. Guardians opens with a truly heartbreaking scene as young Peter Quill’s mom dies of cancer. Moments later Peter is zapped aboard an alien spaceship. Cut to twenty-six years later, Peter is now Chris Pratt and sashaying across the ancient ruins of an alien world, grooving to his Walkman. As he dances toward his goal, he punts several rodent-like creatures, and then grabs one – singing into it like a mic. This is the movie, right here. It’s all about highs and lows of drama and ridiculous comedy working in tandem. It can be sudden and intentionally jarring, but it works. It’s the thrill of the “roller coaster ride” and it’s fun. Pure and simple. Each of the other primary characters – Rocket Raccoon (Bradley Cooper), Groot (Vin Diesel), Gamora (Zoe Saldana), Drax the Destroyer (Dave Bautista), and even the vaguely villainous Yondu (Michael Rooker) – all embodied the films balance of highs and lows. Which is to say that they’re well-rounded, well written, and equally well acted. They all had interesting back stories and they gave us enough to really get to know them and to want to learn more about each one. Gunn did a fantastic job entrenching and fully realizing each of the characters in the expansive cosmic world, and keeping a complementary balance of opposing, yet-interconnected personality types. Just like how the Avengers or even the Ghostbusters, The Guardians effortlessly and flawlessly feel like they belonged together. With ten films under Marvel Studios’ belt, it’s about time they shook things up. This film is very different from Marvel’s previous outings. While Captain America 2: The Winter Soldier is easily one of Marvel’s best movies, it was very much of the style of the previous films. Guardians has the Marvel flavor, but it’s mixed up in such a way that it nearly disappeared altogether into something new and different. Their scope has just expanded drastically. With the Marvel Cinematic Universe now sharing cosmic and Earth-based adventure side-by-side, having a differing style can only help broaden the experience of Mavel movies. Two different styles of storytelling that, much like their comic book counterparts, can easily intersect. I’ve mentioned the heroes, but what about the villains? Well they are fantastic. Josh Brolin as Thanos is superb. Even though we only see him for a few moments throughout the film, Thanos is fully realized. I was a bit worried that, given his appearance, Thanos might seem silly, but they nailed it. There’s a moment when he smiles and it perfectly captures the Mad Titan. Couple that with Brolin’s naturally evil voice acting and bam! Sold! 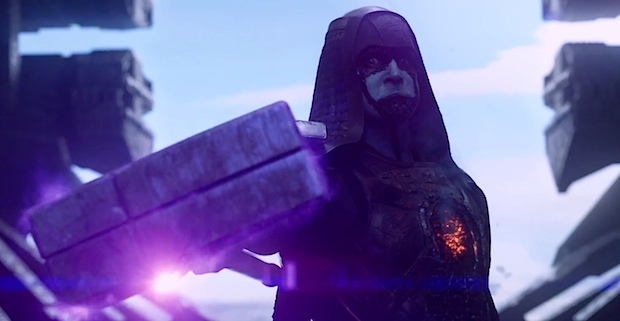 Ronan the Accuser was outstanding as well. With a movie full manics, Ronan’s insanity engulfed them all. There are people who’ve said they weren’t happy with Lee Pace as Ronan. I can’t figure out why. In my opinion, he was precisely the right amount of crazy and scary the movie needed. I mean, if you have the Mad Titan calling the shots, treating even beings of great power as if they’re nothing, how do you show you’re a legitimate threat? Out crazying him sounds like a good place to start. The characters were far from the only stars of the film. This movie covers a lot of ground, and every new locale was amazing. When the crew got to Knowhere – the city within a decapitated god’s skull on the edge of the galaxy – the entire place was eye candy. Sure, it was largely CGI, but this these alien worlds are well beyond the bland backdrops of the Star Wars prequels – these feel alive. And the characters they’re alive with – let’s just say the cameos by other low-rung Marvel characters are incredible. Star-Lord’s ship, The Milano, was great. It definitely had a Millennium Falcon vibe to it, without trying to be it. It felt – and this is exactly what they were going for – like a hot rod. From the paint job to the sounds the engines made… for a car guy like myself it was one of the cooler parts of the film. As much as I love the film, there are certainly things that could have been done better. The fight scenes were alright, but paled in comparison to the fight scenes in Winter Soldier. I loved Drax, but I felt he was taken care of too easily in most of his fight scenes. He should have either lasted longer or just done a better job holding his own. Generally, the exposition was incorporated very well into the visual side of things, but a few times they got a little heavy-handed with it. RICHARD RIDER DIDN’T SHOW UP! Dammit Marvel! That’s all I ever wanted! Green Lantern was a flop! You have the power to make the ultimate space cop movie!!! Not even a nod to Rider? What the hell!? …You’d better be planning something, seriously. As for the very, very end of the movie… I’ll be differing to Cap for that. You can read his article here. That’s my take – I know you guys must have some feelings on Guardians – let’s have it! 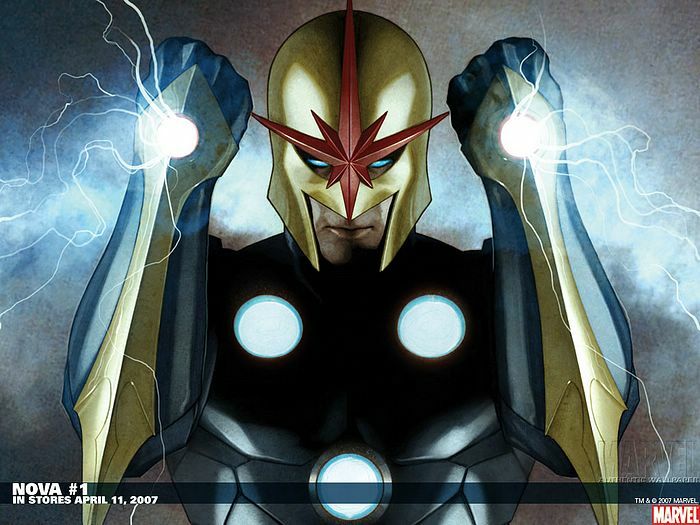 Are you like me and dying to see Richard Rider become Nova Prime? (Seriously, Disney, I’ll give you all of my money for that.) Did you like that thing that Star-Lord did with the rockets on his boots with the jumping and shooting his cool guns? Yeah… that was awesome. 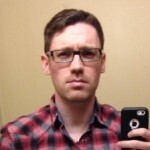 Writer, gearhead, comic reader, and all around great Ghostbuster. He lives to serve for the glory of the God-Emperor of Catkind and will argue day and night to tell you why Captain America is better than Batman. Let's be honest, who isn't better than Batman? ONLY EVERYONE!